This is the first part in a series of clips from an interview I did about diggin', making beats, emceeing, DJing, my collection etc. 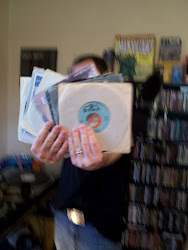 The 1st portion is about my music collection, how I file it and getting in on some nerd ish. This is Dawhud and you're not really watching "Crate Diggers", but it's pretty damn close. On the real, I've been filing my CDs and tapes like this since I was 11 or 12 years old. Shout out to Bobo with the cameo.